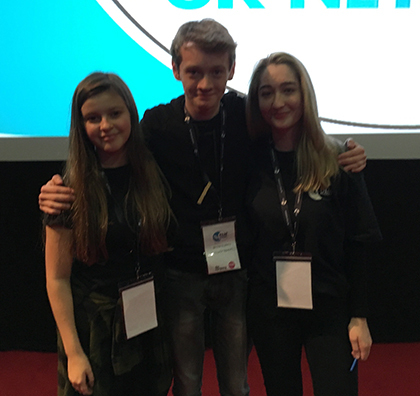 Three Media Studies and Film Studies students at The Sixth Form College, Solihull took part in a prestigious training course run by the British Film Institute over half-term. The BFI Film Academy programme took place at the MAC in Birmingham at the end of October. More than 60 young people applied to take part, with 20 getting places, including three from the College. The programme sees participants take part in a series of masterclasses with industry professionals, giving them tips on how to get into and succeed in the film industry, as well as the chance to do project work of their own. “We created and developed an idea for a short film and then filmed it. It involved both live action and animation at Yamination Studios (near the Custard Factory in Birmingham). We both had about 16 hours to film, including setting up shots. This led to a very short film, but it’s one we are very proud of. It premiers on Saturday 11 November at the MAC, where a lot of the pre-production work was also based. Work experience and training courses like this are a valuable addition to A level study for Media and Film students, with competition to get into the industry fierce.